In the week ending May 16, the advance figure for seasonally adjusted initial claims was 631,000, a decrease of 12,000 from the previous week’s revised figure of 643,000. The 4-week moving average was 628,500, a decrease of 3,500 from the previous week’s revised average of 632,000. The advance number for seasonally adjusted insured unemployment during the week ending May 9 was 6,662,000, an increase of 75,000 from the preceding week’s revised level of 6,587,000. 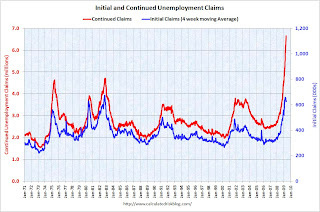 The first graph shows weekly claims and continued claims since 1971. The four-week moving average is at 628,500, off 30,250 from the peak 6 weeks ago. Continued claims are now at 6.66 million – an all time record. Typically the four-week average peaks near the end of a recession. There is a reasonable chance that claims have peaked for this cycle, but it is still too early to be sure, and if so, continued claims should peak soon. The level of initial claims (631 thousand) is still very high, indicating significant weakness in the job market. For the week ended Feb. 28, 639,000 Americans filed initial jobless claims, down 31,000 from the 670,000 claims reported the previous week. The 4-week moving average of initial claims increased by 2,000 to 641,750 from the previous week. The number of Americans continuing on unemployment insurance dropped by 14,000 to 5,106,000, edging off the record high set the prior week. Tomorrows unemployment report will be interesting.